Trim. Ships in 1-2 weeks. Dimensions: 9/16" X 2-1/8". 8' long. 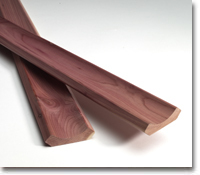 Eastern red cedar cove moulding can be used to finish the corners in your cedar closet as well as the joint between the ceiling and walls. Dimensions: 9/16"X 2-1/8". 8' long.